Attorney Gary Sirbu argued that Antoine Mackey cannot get a fair trail alongside Bey IV, because prosecutors will introduce evidence of numerous other crimes involving the former bakery leader in which Mackey did not participate. Mackey “needs a fair trial,” Sirbu said. But Superior Court Judge Thomas Reardon denied the motion to sever the case, saying the evidence that prosecutors intend to introduce would still be used against Mackey even he is tried separately. 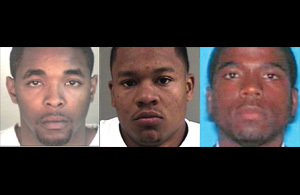 Bey IV and Mackey, both 25, are facing murder charges in connection with the Aug. 2, 2007, shooting death of Bailey, editor of the Oakland Post, and two others in unrelated shootings. Thursday’s hearing, delayed for nearly two hours because of a problem transporting the defendants from the Santa Rita Jail in Dublin to the Rene C. Davidson Courthouse, marked the final issues to be decided in the case before jury selection begins Monday. As many as 1,000 prospective jurors will undergo preliminary screening and fill out questionnaires over four days, although Reardon said earlier this week that only “Rebecca from Sunnybrook Farm” would think that 250 people will report for duty each day. Opening arguments are scheduled to begin March 21, although Reardon still has to rule on a pending change of venue motion. Attorneys for Bey IV have said media around the case will keep the former bakery leader from receiving a fair trial in Alameda County. In Thursday’s ruling, Reardon said Deputy Alameda County District Attorney Melissa Krum is entitled to show the “original structure and ethos” of the bakery and the situation “(Mackey) found himself in” when he joined the group. Sirbu argued that much of the evidence concerning how Bey IV ran the operation occurred when Mackey wasn’t a member of the group. Krum argued that Mackey is “equally culpable in all three murders” and that the evidence she plans to introduce is relevant to Bey IV’s co-defendant. She intends to show that Bey IV held sway over his followers, ordering them to commit other crimes such as destroy a car by gunfire, ransack two liquor stores and kidnap two woman and torture one of them in an attempt to learn where a drug dealer hid money. She also intends to introduce evidence from two financial cases against Bey IV. Devaughndre Broussard, 23, who has confessed to killing Bailey, told grand jurors that Bey IV promised to teach him and Mackey how to profit off fraudulent credit lines if they killed Bailey to stop him from writing in the Oakland Post about the bakery’s financial woes.